Engaging the private sector in the implementation of Mali’s national malaria control policy, including the accurate malaria diagnosis and treatment in private-sector pharmacies, remains a significant challenge in the country’s fight against malaria. A data collector at a private pharmacy in Mali. To strengthen the link between Mali’s National Malaria Control Program (Programme National de Lutte contre le Paludisme, PNLP) and private-sector pharmacies, USAID’s Systems for Improved Access to Pharmaceuticals and Services (SIAPS) program conducted a survey to determine the feasibility of expanding access to malaria testing and treatment through private pharmacies. The survey findings were reported at a recent national workshop, attended by all public and private sector stakeholders involved in Mali’s fight against malaria and chaired by the public health technical advisor of the Ministry of Health. 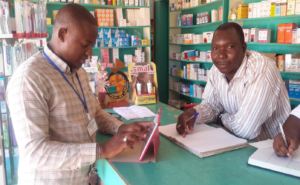 According to the Secretary General of the Mali Pharmacists’ Union, the survey supported increased engagement with private pharmacies in confirming suspected malaria cases and providing appropriate treatment. The Secretary General added that this new approach will help improve the availability of malaria commodities at a lower price. The director of the PNLP emphasized the need for an implementation plan to expand access to malaria testing and treatment in private-sector establishments—including an estimated budget and funders’ meeting—to mobilize resources. He also called for the repackaging of donor ACTs to sell in private pharmacies, and for the establishment of appropriate tools for tracking medicines provided to the private pharmacies before any implementation.